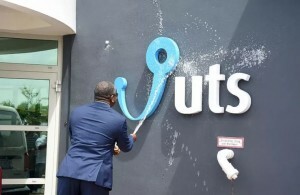 WILLEMSTAD - The first dismissal round at the telecommunication company UTS has started. 180 employees of the company were told yesterday that the end is in sight. 100 have already voluntarily left. The 180 layoffs are spread over three rounds, of which June is the first. December is the second round and a year later the third. UTS thus goes back from 480 employees now to 205 in 2020.